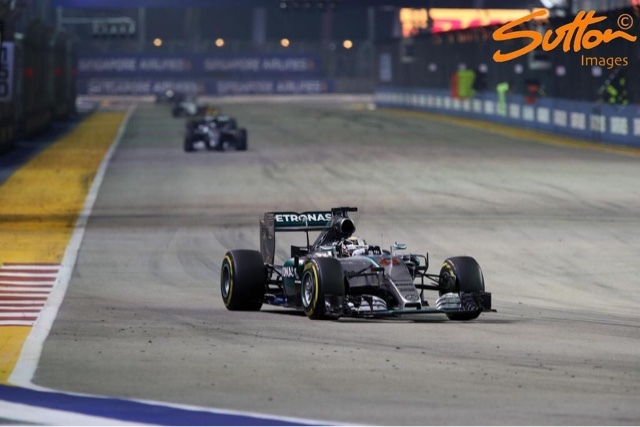 Mercedes have, up until Singapore been resplendent in the face of the new technical regulations. Yes, you can argue that they had their fair share of failures during 2014, but these were minuscule in the face of their opposition. Only an internal driver fued kept the Championship battle alive just as it seemed would be the case for 2015 too. However, a reinvigorated Ferrari have leapfrogged Williams and are now focused on toppling the silver arrows too. 2015 may be a bridge too far but the Scuderia are certainly moving in the right direction and their latest powerunit token spend has certainly narrowed the gap. So, what of Mercedes quite frankly poor showing in Singapore? For me it is a one off, a blot in the copy book and something that won't be easily repeated during the remainder of the races, save obsession by the team and drivers on what went wrong. Singapore is a fairly unique circuit in terms of temperatures and corner characteristics. The tyres are subjected to a higher load for a sustained period with full throttle only achieved for 36% of the lap. This not only puts an emphasis on the tyres surface temperature but also the tyres bulk (internal) temperatures. The changes in tyre pressure and tyre blanket protocols in the wake of the Belgian GP will not have helped matters either as the teams shuffle to adjust. Lest we forget the tyres have their own working ranges, with teams focused on designing their car more squarely around a certain temperature to extract performance from a given window. The problem is that the operating windows shown here actually narrow a little more in terms of that peak operating window, you know, what a driver would describe as the feel good factor or being in groove. Although the protocols changed by the FIA/Pirelli can't be held to account for all of this issues faced by Mercedes they do have some bearing, especially as we have seen other teams made the opposite stride. Mercedes were around 1.5 secs off the pace, a monumental shift where at some GP's they've outwardly looked to have pace in hand. The increase in pressure seen at the last 2 GP's will also dynamically affect the tyre, changing the amount of tread platform shown to the track. This clearly has an impact on temperatures and therefore performance. Mercedes weren't the only Mercedes powered team that seemed a little off their usual pace though and could be that the tyre issues combined with the torque delivery from the PU106B exacerbated their problems. It's also worth noting that the Mercedes powerunit does appear to suffer a little more when the temperatures go up, highlighting how HPP have targeted certain temperature thresholds and when they aren't in that sweet spot lose a little performance. We must also remember that Mercedes have pulled the trigger on their 7 remaining tokens with an eye on the development of the PU106C, perhaps compromising some minor elements in order to bring larger scales changes with next years 25 tokens. This would clearly put them at odds with the other Mercedes powered teams and perhaps compromising them further. You could argue then that they went to early, as they had one more of their four free powerunit component allocations left for the season. However, the threat from Ferrari and the valuable data that could be gained between now and the season coming to its conclusion was clearly enough. Whatever the actual reason for Mercedes slump in Singapore it will likely be an accumulation of issues and not fixable with one silver bullet. Will it continue to haunt them going forward? I doubt it, but with Suzuka just around the corner we don't have wait long to find out. Mercedes' home service will continue in suzuka.Singapore was just another Melbourne, just throwing surprises not as ideal to some cars.